The trail we were on followed the Firehole River in Yellowstone National Park. 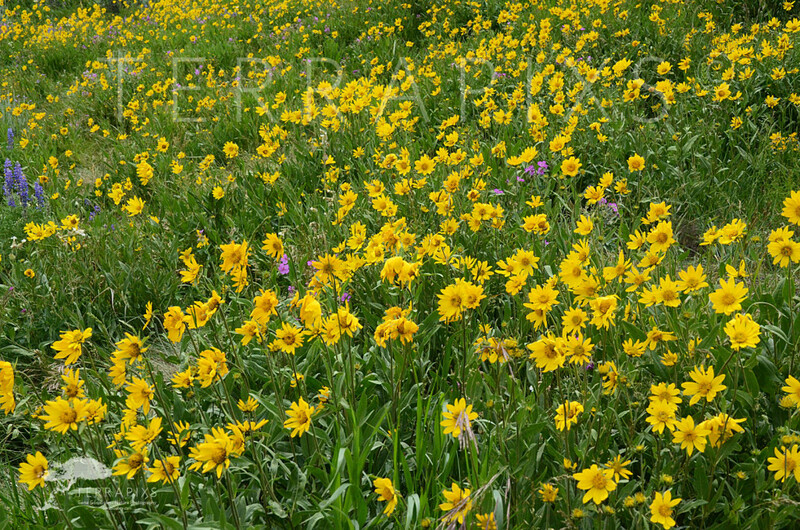 Passing through spruce-fir forest it made an abrupt turn and spilled into a small meadow ablaze with yellow sunflowers and dotted with blue Lupine and Phlox. It was early morning and the air smelled coniferous, like Christmas in July. Some people treasure unusual flowers, like rare orchids that hide in woodland bogs but I have always liked sunflowers. I know they are everywhere and come in a multitude of shapes and colors(the second largest family of plants with nearly 33,000 species worldwide- Orchids are the largest), but they are always welcoming, like an old friend. The name “sunflower” generically refers to members of the plant family Asteraceae, Aster being the “type genus”, that is, the specific group within the family for which the family is named. The suffix “aceae” is the Latin identification of a plant family, so any word with the suffix “aceae” denotes a plant family group. The vernacular name “daisy”, derived from the Old English name of a specific member of the family. Members of the family are also referred to as “composites” since what may look like a single flower is actually many small individual flowers surrounded by generally colorful bracts or sepals (what most people think of as “petals”). Most are “herbaceous”, that is, they are non-woody though some exist as shrubs, vines or trees. So, you have had perhaps your first lesson in plant taxonomy/structure. Carolus Linnaeus, the father of plant taxonomy and creator of the binomial system of nomenclature (each plant with two names, a genus and a species name-subspecies may also be added) would be proud. With so many species in the Aster family it is not uncommon to see 10-20 species even on a short hike through the woods and dale. And they come in many sizes and colors, some tinted this way and that. Sunflowers have a cosmopolitan distribution being found everywhere except Antarctica and the extreme Arctic. No matter where they are found they not only add beauty to the landscape but also are important economically providing such foods as cooking oil, lettuce, sunflower seeds, artichokes, herbal teas and much more. The lowly dandelion that keeps pushing its yellow flowers up through your manicured lawn are composites introduced by Europeans who relished their edible green leaves. So, be on the lookout for sunflowers and always protect and enjoy our precious natural resources!